use one method of measuring and some another? Could this be the reason some recipes have failed to meet your expectations in the past? The way you measure flour can make a big difference in baking. What method do you use when measuring flour? Sift flour into measuring cup. Scoop flour up straight from the bag. Stir with a knife, scoop up and then level. In my new book I tell you how I measure flour perfectly for each recipe. How much does 1 cup of flour weigh in your kitchen? The high quality of this book is immediately apparent in the beautiful cover, richly textured cloth binding and opulent pages. From the moment I opened the book I started to wonder which recipe I would try first. The Cream of Mushroom and Fresh Herb Soup is calls to you from the page, the scent of fresh basil rising to meet you. The style of Jeff Keys cooking has some secrets he discloses in this book. One is a spice he uses on steaks, in stews and when roasting meats. This is a dry spice you will want to make up first because it is used in many of the recipes. When making the brown sugar marinade, you will need two teaspoons. It is a mixture of spices made with ingredients like paprika, fennel seed and thyme. These ingredients are easy to find in your local store. You will also find some ingredients like the Boboli pizza crusts being used as a base for a pizza feast. One recipe is for the pizza crusts and filling and then Jeff expands the recipe for four types of dinners. Prawns, asparagus and grilled duck are all used in various recipes to enhance and build upon the first. 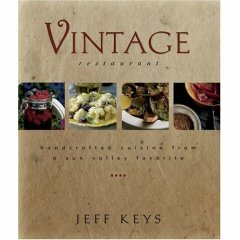 Vintage Restaurant is a unique and collectable classic cookbook with recipes you won't find anywhere else. This is comfort food at its most gourmet and it will make you long for a trip to Sun Valley.